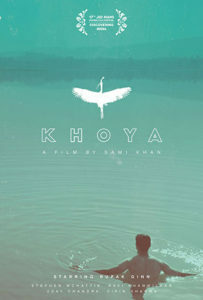 The Adoption Museum Project co-presented the film Khoya (Lost) at the San Francisco International South Asian Film Festival. This is a fictional story of an Indian, transracial adoptee who grows up in Canada and returns to search for his birth family in India. We collaborated with Nisha Grayson, who was adopted from India and grew up in the U.S. Nisha’s return to India to search for her birth mother is told in the film You Follow: A Search for One’s Past. Nisha’s review of Khoya (Lost) is informed by her personal experience and a post-screening conversation with writer/director Sami Khan. Khoya (Lost) is told from the adopted person’s perspective, and it points to some of the complexities and challenges of international adoption. This is a fictional story inspired by the filmmaker’s personal experience as the son of a first/birth parent. It’s a highly evocative film featuring stunning cinematography. Sami Khan is the Writer and Director of Khoya (Lost). He is a biracial man (British, Indian) who grew up in Canada. The San Francisco International South Asian Film Festival (http://www.thirdi.org) is presented by 3rd i Films, the oldest South Asian media arts organization in the U.S. 3rd i Films promotes diverse images of South Asians and catalyzes change through independent film. This is the festival’s 14th year. It runs November 10th-13th in San Francisco and November 19th in Cupertino. The five-day Festival will screen 15 programs of narrative and documentary features and shorts by independent filmmakers from South Asia and the South Asian Diaspora, including stories from India, Pakistan, Bangladesh, Canada, and the USA. There will be audience Q&A with the filmmaker, Sami Kahn, following the screening.